On August 21, 2017, millions of people across the United States will see a total eclipse of the Sun. This page will be a resource for individuals planning to visit public lands to view the eclipse in Central Oregon, on the east side of the Central Cascade Mountain range. 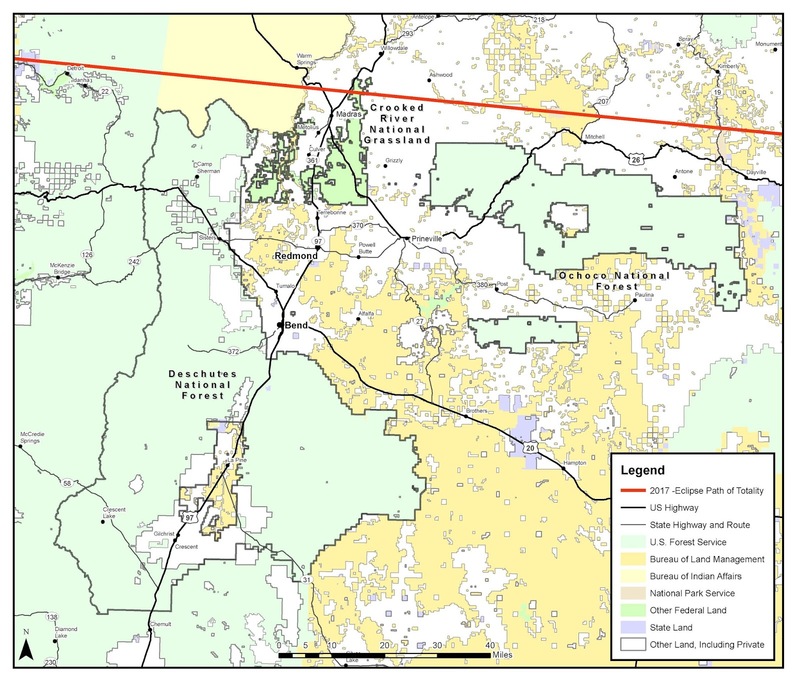 This area encompasses federal lands around Sisters, Madras, Prineville, Bend, La Pine and Mitchell, Oregon. Planning to camp? Fire Restrictions Are in Place--Be Prepared! Camping for the eclipse? Click on the link to start planning your trip! · Understand risks, respect signs and barriers, and stay within your limits. · Most remote areas have limited services and facilities, so pack plenty of food and water. · Be prepared for warm temperatures and bring sun and eye protection. · Plan ahead to ensure a safe and fun experience. · Expect large crowds. Most lodging is booked. Options for camping are limited. · Familiarize yourself with the rules and specific information about the site you are visiting. · Cell service may not be available, so plan your route in advance and pack a map. 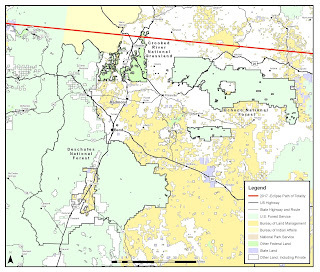 · Many roads on public lands are gravel and may require a high-clearance or four-wheel drive vehicle. · Help us protect our lands for all to enjoy. · Tread lightly and leave no trace. Leave your site better than you found it. · Remove all trash and remember to pack it in, pack it out! · To learn more, visit www.lnt.org/learn/7-principles. · August is peak wildfire season in the Pacific Northwest. A small spark can rapidly become a large fire. 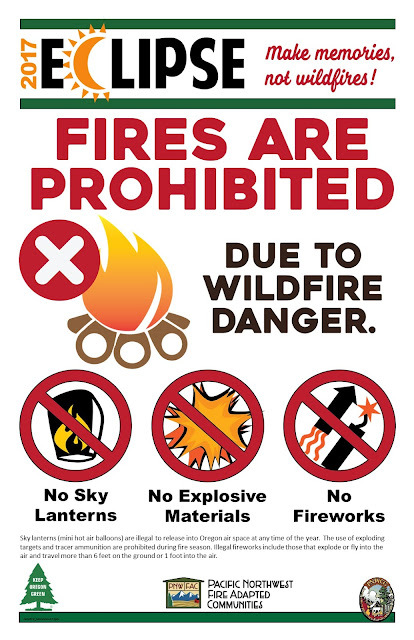 · Know fire risks and respect fire restrictions, such as campfire bans. · Avoid parking or driving on dry grass as your vehicle can spark a wildfire. · Vehicles are required to have a shovel and fire extinguisher or gallon of water in many areas. Welcome to Central Oregon Public Lands! 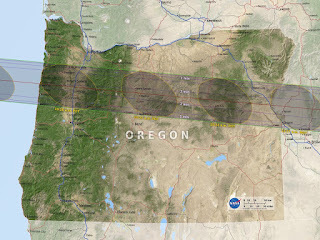 During the August 21, 2017 total solar eclipse, the Moon's umbral shadow will fly across the United States, from Oregon to South Carolina, in a little over 90 minutes. The path of this shadow, called the Path of Totality, is where observers will see the Moon completely cover the Sun for about two and a half minutes. 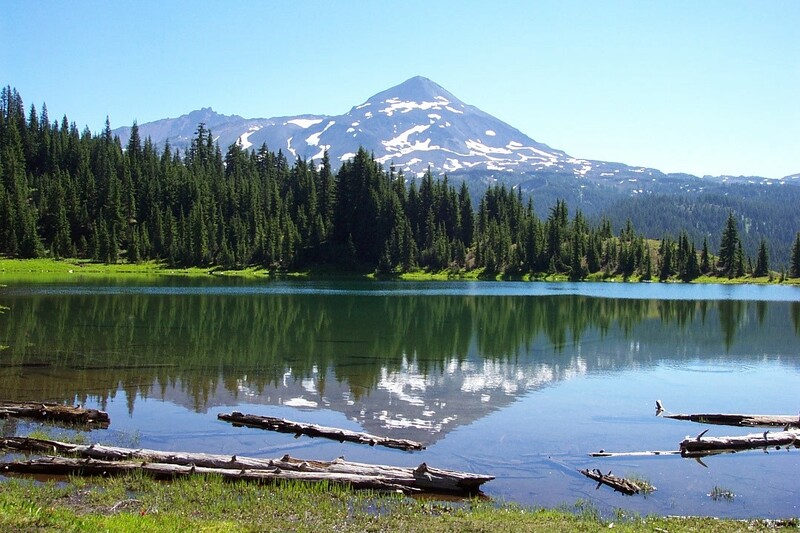 Here in Central Oregon, we are expecting a large volume of visitors due to reliably clear skies and close access to large population centers along the Pacific Coast. 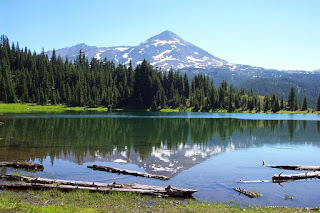 Check this blog frequently to receive updates and announcements from public land managers and other agencies about what to expect if you decide to visit Central Oregon for the eclipse.